Need more information about booking Property 4290936 ? 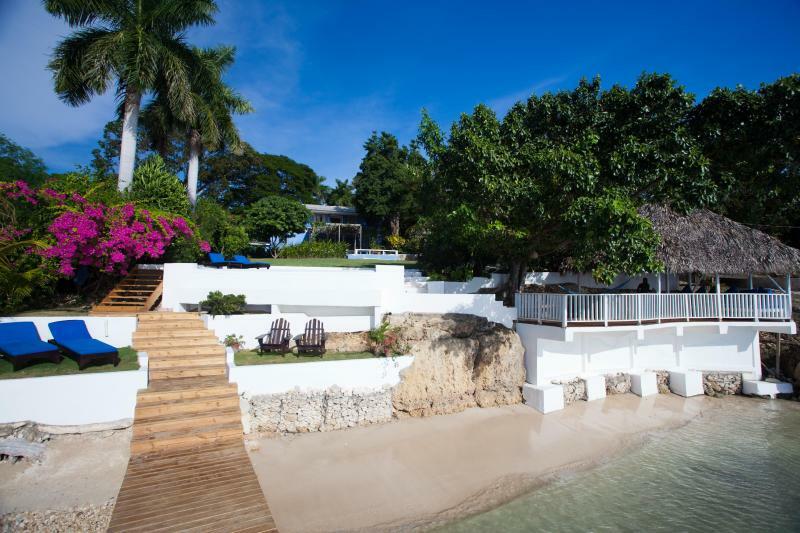 Culloden Cove is a beautiful villa with a private beach, jetty, swimming pool and an acre of tropical gardens on the unspoilt south coast of Jamaica. It is ideal for family vacations, groups of friends, and romantic getaways. The villa combines tranquility and complete privacy with access to top tourist attractions. We are the number one villa in Jamaica according to traveller ratings on Trip Advisor and have received a Trip Advisor 2014 Certificate of Excellence. In 2013 we won a Flip Key ‘Gold Top Vacation Rental’ award. Our friendly staff will provide a great welcome and make you feel instantly at home. Relax - This is the perfect place to relax and unwind, away from the stresses of life. Let our welcoming staff take care of you while you stretch out in a hammock, swim in the crystal clear water and enjoy the gorgeous sunsets. Dine - Culloden Cove used to be an award-winning restaurant and the villa has carried on this reputation for good food. Let our chef design a menu to suit your tastes. Sleep - The property can sleep up to 10 people on comfortable beds with Egyptian cotton sheets. We have cribs for infants and mattresses for additional guests if required. Explore - The property provides a great base to explore this lovely part of Jamaica. Top attractions -including the seven-mile beach of Negril, the beautiful YS waterfalls, cruising on the Black River looking at crocodiles, and the idyllic offshore Pelican Bar on a sandbank in the middle of the sea – are all within easy reach of the villa. Traveled with group of 7 friends for a week long "girls getaway", Property comfortable, infinity pool great. Owner, Andy made the reservation process easy and promptly responded to all inquiries. The staff really made our stay exceptional...they are terrific! Food spectacular! If you are looking for endless, resort-type on site entertainment...this is not for you. If you want one of the most relaxing vacations ever...with an incredibly attentive staff, this is the place. Would go back in a second! The property is gorgeous. I'm talking about sweeping views of the setting sun, exotic flora and fauna, charming rooms done in all white with dark wood furnishings. My wife and I stayed in the Garden Cottage, which was lovely. The staff could not have been friendlier or more accommodating. Though shy at first, they quickly warmed to us. Gail, in particular, was a gem. The cooking was beyond belief. Everything was fresh, hearty, home-cooked, perfectly seasoned, in a word: delicious. High points include the curry goat, stewed pork, and garlic lobster. Deserts were next level, especially the key lime pie, which Gail was nice enough to show my wife how to make. Finally, Culloden Cove is convenient to a lot of other great places. We traveled to Treasure Beach, the Appleton Estate, and Negril. The roads were a little rough, but we were always back before sundown and greeted with something tasty to eat. Our stay was far too brief, and we'd definitely recommend the place to anyone else considering a trip to Jamaica. What a peaceful, beautiful location. The villa is spacious and has a fantastic infinity pool. The service provided by the staff was exceptional. Dion (the chef) prepared some of the best meals we ever had in Jamaica. Vernon and Marvin (security) made us feel very safe. Special thanks to Mervin for helping get our "grill" ready for a late night burger. Karon the gardener, kept the property clean and knows everything about the plants and fruit trees on the property. He gave us a great tour and was kind enough to pick us fresh grapefruit for breakfast one morning. If you are looking for an action packed place to go in Jamaica...don't go to Culloden Cove. If you are looking for peace and quiet, beautiful scenery, outstanding food and great service, then this is the place for you! My family of four, just ended a wonderful week at Culloden Cove. The beauty and tranquility was indescribable. The staff was attentive and the cooking was the star of the show. They all made us feel as this was our home. We took a day trip to Beaches Resort in Negril and it only reinforced what a great decision it was to go with a private villa. We also took day trips to Black River, and YS Falls, all was within a short drive from the house. But you don't have to go anywhere at all as the pool and beach here were amazing, you can snorkel right off shore here and see some amazing coral and fish, and I spent countless hours swinging in the hammock overlooking the bay. If you want a longer stretch of sand, there is a large beach within a 2 minute walk. Our first night in town, at andy's advice, we attended a wonderful farm to table dinner in Treasure Beach at the home of a hotel owner and his family. An interesting mixture of locals and tourists, with freshly prepared foods was an experience not to miss if you are in town during their monthly dinner. I also enjoyed shopping in town and just walking around the town and getting a feel for the life in this picturesque fishing village. If you are considering a villa rental in Ja, book this one now, you will not be sorry. The sunsets alone are worth the price of admission. We spent a wonderful weekend at Culloden Cove in the month of November 2013. It was 4 adults and 5 children. The location is beautiful, the infinity pool looks on the Caribbean sea. The property is lush with tropical plants and every morning and evening we watched the famous Jamaican doctorbird feed on the flowers. I have lived in Jamaica (in Kingston) for 9 years now, and I have been to numerous villas with my family. Still, I have to say that this weekend was the best experience for us in a villa on the island!!! The service by the 2 ladies was excellent, the food was great. It was very relaxing! We are planning to go back to the villa this year. This was my second time at Culloden Cove and everyone in our group of ten had a fabulous time. Once again, the staff impressed us all. They are so kind and so good at what they do. We came back to Kingston totally relaxed. Everyone said that they hope to go back again. Thanks, Andy, for sharing your beautiful place and for caring about the quality of the experience of your guests...and for making it affordable. We are all grateful. We recently stayed at Culloden Cove for our honeymoon and it was true paradise! The staff went above and beyond and there was never a moment to want for anything. We would go back in a heartbeat! From the moment we were picked up at the airport by our driver, Wolde (whom andy arranged), we felt safe and well taken care of. Wolde was full of interesting Jamaican facts as we took the beautiful drive to the other side of the island & upon arrival at the villa we were greeted with smiles by Karon and Gail. Karon keeps the property in pristine condition & later in the week gave us a tour of the gardens, pointing out all of the different kinds of plant life & trees. He's quite the bird expert as well! Without hesitation Karon climbed up trees to pull down fruit that we had never tried before. Shortly after we arrived the first evening, Gail presented us with the most fabulous lobster dinner you could dream of & she continued to turn out gourmet meals 3 times a day, every day with fruity cocktails & snacks like homemade sweet potato chips in between. Wolde gave us the heads up that she makes a killer chocolate cake & does she ever! After our first breakfast we sat down with Gail & discussed a menu for the week & Gail did the shopping. On Saturday, we went to the market with her, which we highly recommend. We only ate one meal outside of the villa at the Pelican Bar...more fantastic lobster! One of our favorite parts of the villa was that just off of the dock there is great snorkeling! One morning I got a massage on the veranda & the day we went to the Pelican Bar we had a guide the entire time who also took us to see a new school & to an artist's shop. Mervin is the nightly security guard who comes promptly each evening to watch over the property until morning. We enjoyed his company quite well too & felt so safe. Everyone was amazing, the views & privacy unparalleled. We left kicking & screaming & can't wait to return to celebrate an anniversary! Thank you to all! We stayed as a family of 6 adults in September & had the time of our life! Andy the owner is really easy to do business with & communicates well. The location is superb with its own small private beach as well as an infinity pool. The grounds are spectacular with fruit trees, abundant flowers and many different species of birds. The housekeepers (Dion & Lilly) are superb cooks & hosts, their food was top drawer restaurant standard the whole time we were there. Karon the caretaker / gardener is an interesting guy & is really knowledgeable when it comes to the plants in the garden. Mervyn provided the night security which was discreet & appreciated. We are already saving hard to go again next year (but for longer)! Thank you andy & the team! I recently enjoyed a lovely stay at Culloden Cove this past June. The house, and especially the staff, contributed to great memorable experience. Everyone loved the food the staff cooked, most notably the jerk chicken and goat curry. The house was clean and well decorated. We also felt safe the whole time, as there is a security guard patrolling the premisses. Overall, I would highly recommend this rental property. You can get in touch with Mr (the owner) through the contact form on this page. Send Mr (the owner) an email through the contact form on this page. Alternatively, if there’s a phone number on this page, you can call them. How do I contact Mr (the owner)? You'll need to send Mr (the owner) an inquiry to book - the owner will let you know how to pay. If they accept online booking they'll send you a quote and info on how to pay. If you pay through our website you’ll be covered by Payment Protection. Or you can send Mr (the owner) an inquiry through the contact form to request a quote. Mr (the owner) will email you the total cost for your dates and how to pay. Send Mr (the owner) an inquiry through the contact form requesting a quote for your dates. Mr (the owner) will email you the total cost for your dates and how to pay. Mr (the owner) of this property is responsible for taking and refunding your damage deposit. The damage deposit terms should be agreed before booking and outlined in the booking contract, if Mr (the owner) supplies one. Please refer to these details or contact Mr (the owner) directly if you have any questions. You'll need to contact Mr (the owner) to cancel. They should have provided their contact details when you made your booking - otherwise, email them through the contact form. You'll need to contact Mr (the owner) to edit your booking. They should have provided their contact details when you made your booking - otherwise, email them through the contact form.